The Space of Love, the third book of the Series, describes author's second visit to Anastasia. 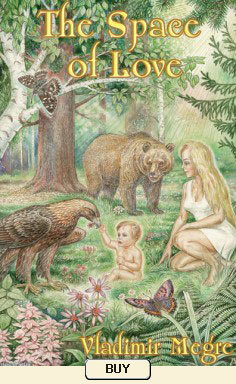 Rich with new revelations on natural child-rearing and alternative education, on the spiritual significance of breast-feeding and the meaning of ancient megaliths, it shows how each person's thoughts can influence the destiny of the entire Earth and describes practical ways of putting Anastasia's vision of happiness into practice. Megre shares his new outlook on education and children's real creative potential after a visit to a school where pupils build their own campus and cover the ten-year Russian school programme in just two years. Complete with an account of an armed intrusion into Anastasia's habitat, the book highlights the limitless power of Love and non-violence.